Come See Us at the Caledonia Exhibition, Queens County Fair, in Caledonia, Queens County, Nova Scotia this week from 15 to 19, Sept 2015. Attending the Caledonia Exhibition is something I’ve done from the time I was a kid, and it was there it was on the 19th of Sept 2009 that I joined Watkins and became a Watkins Products Consultant for the second time! I had joined, for about a year, about 7 years previously, and when I joined this time, 6 years ago, I did not expect to be doing this as a Business! Nor did I expect I would reap the many benefits and rewards that have come to me as a Watkins Product Consultant, and now Manager! I’ll write more about that later this week, for now suffice to say I’m very happy with Watkins, Watkins Products, and I’m looking forward to seeing You in Caledonia this week! I love that their Website Header says, “We’re more than a Fair” because they truly are, the Caledonia Exhibition is one of, if not the, best Old Fashioned Ex in Nova Scotia, and for many of us it’s like a Homecoming! Pretty good, considering I’m from Yarmouth, Nova Scotia, but have always been made to feel like one of the Family there! Quite possibly because Myrna & Paul Ellis of Kempt were best friends to my Mom & Dad, Victor & Enid Hurlburt, and stood for each other at their Weddings. I mention this, because both my Mom, Enid, who passed in 2004, and Myrna (who is celebrating her Birthday this week) both had their Birthdays during this Exhibition Week. ((If you See Myrna, be sure to Wish Her a Happy Birthday)). (Happy Birthday Myrna). So, come out and see us at the Caledonia Exhibition, also known as the Queens County Fair, from Sept 15 – 19, 2015. 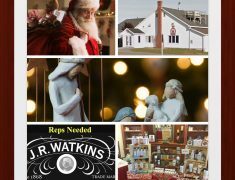 We’ll be there with Watkins Products, and there will be lots of other Vendors, Displays, and Activities there for the whole Family! This entry was posted in Market and Community Events. Bookmark the permalink.